Tradition is flying out the window in Perth, with a more modern, efficient way to build homes emerging. Where once it was common for homeowners to engage an architect to design their dream home and then farm the plans around to contractors to build it, savvy homeowners are now appreciating the benefits of a design-build partnership. Design-build is where one entity enters into a single contract to provide both design and construction services to the homeowner. This saves the complications of having two contracts and offers a more harmonious building experience with partnerships that work in unison. Adrian Zorzi’s AZ+ collaboration with Cox-Howlett & Bailey Woodland offers this design-build advantage, with well-crafted and considered home designs from WA’s most prestigious architects and quality spaces built by a reputable builder. The Perth market is shifting to favour tried and true architect-builder partnerships for five very convincing reasons. 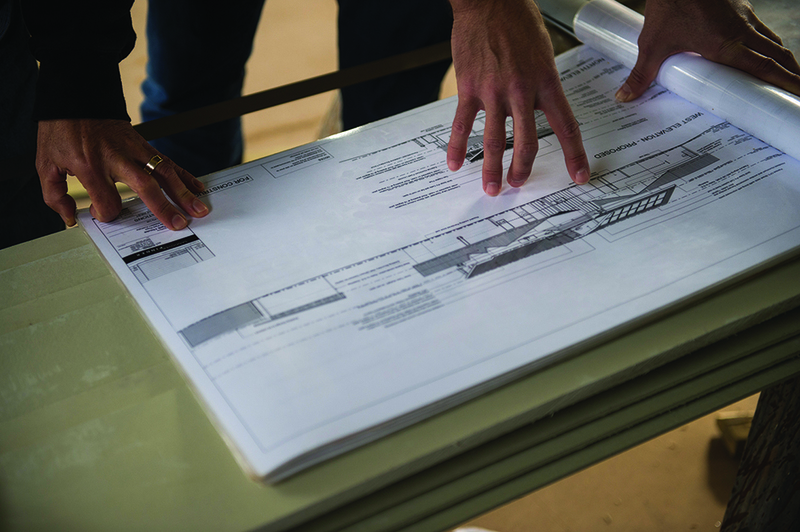 This single workflow is a true game-changer in a residential construction project. With the design and contractor roles integrated, clients get a one-stop-shop from their team for everything from the initial concept design through to completion. A single team with a shared focus creates better relationships, streamlining the project and fostering a collaborative alliance between the architect and builder, and the design-build team and the homeowner. The client and design-builder are united from the start of the project, creating an inherent efficiency and the common goal of completing the project faster, more cost effectively and to a higher standard from the word “go!” In short, everyone is playing on the same team. In practical terms, you’ll get your home sooner and with better cost efficiency. A tighter, more proficient project timeline where all parties are on the same page inevitably results in less hiccups and a more attractive delivery date on your brand new home. Cost savings come where the architects work with the construction supervisors and cost estimator, along with the rest of the team. They have almost instant access to the resources they need to provide accurate cost feedback to the client on design details. It also allows more design freedom, where we can negotiate how to achieve a desired look within budget or indeed experiment with more unique and luxurious materials and finishes as we go through the project lifecycle. This means greater transparency and less chance of unwanted financial surprises down the track. Design-build operations assume that the owner wants to take an active role in the design and construction of their home, and indeed welcomes their input. For us this is a win, as having our clients jump in on the creative process means they are assured the exact result they were after, and a happy outcome is the key to a successful home building experience. Having them working alongside us means we ensure our clients understand every aspect of the process and are fully informed at every step. In traditional building approaches the owner can becomes a middle man, which can get them tangled in disputes between the design team and the builder. Having a single entity responsible for everything means there is no confusion about who should be doing what and when. It minimises conflicts on site, with the one team being responsible for completion schedules, management of timelines and planning, and keeping the project on time, to spec and within budget. The best working relationships are cemented by honesty and clear communication, which can sometimes be lost when an architect and builder are engaged separately. The client must explain his or her wishes to the architect, whose design is then submitted to the builder to interpret. What the architect had envisioned and how the builder reads the plans can be two very different things, and plenty of valuable build time can be wasted waiting on clarification and modifications. This back and forth is an unnecessary interface, as with a design-build partnership the home evolves in real time, with the client and the architect present to give his or her input. Changes can be made swiftly and bottlenecks are done away with. What’s great about this project approach is the synergy that is created from having everyone working together as a team. Accomplishing the desires of the client means a superior home and a harmonious home building experience for everyone involved. Whichever way you cut it, design-build approaches are proving an increasingly attractive option for Perth homeowners building their dream homes to consider.